Everyone in my family loves good ice cream and in the summer we always try and make some of our own. 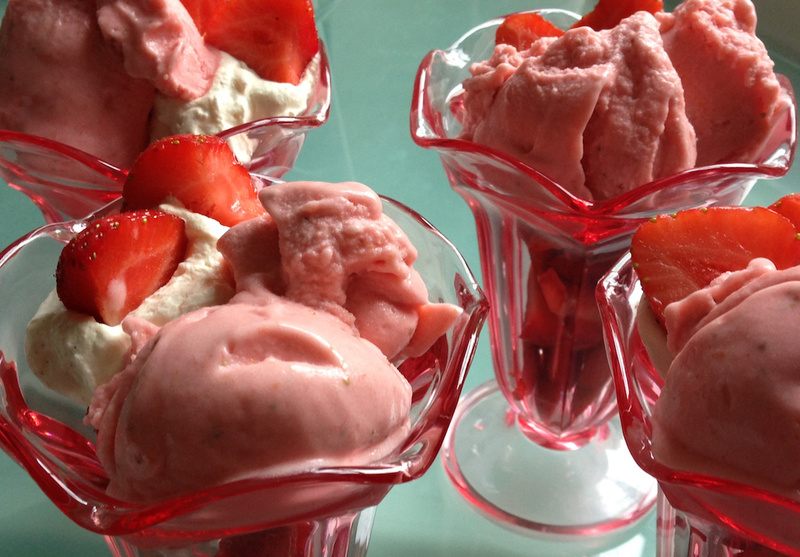 Yesterday, I was inspired to make some strawberry gelato because the British strawberries available now are so flavoursome and at their best. Perhaps one of these days I will splash out on a fancy ice cream maker that you just have to plug in, but for now we have to make do with a cheap and cheerful ice cream maker that needs to be frozen for 24 hours beforehand. So, before hitting the shops the bowl was duly put in the freezer. If you don’t have an ice cream maker then fear not! I also tested this without, by just popping it in the freezer after whizzing it up. The result was less creamy but trust me, equally as tasty. We have tried quite a few recipes in the past but I haven’t found one yet that makes an ice cream as good as the strawberry ice cream sold by our local Italian cafe. Often they are just too creamy and this overpowers the flavour and makes them a little too rich. So it dawned on me to try a gelato recipe. Gelato has become more popular in the UK over the last few years. A gelato isn’t based on a custard mixture as ice cream is and uses less cream, and the mixture is not so rich because there is less fat. It’s a step between icecream and sorbet I suppose. Anyway, we made the mixture which was easy peasy, chilled it for a few hours (to speed up the churning process), popped half of it in the ice cream maker and in just 10 minutes we had made the most divine strawberry gelato that was intensely flavoured without being too rich. DELICIOUS! I cannot rave about it enough and we WILL be making some more tomorrow with the other half! Home made ice cream when just made is still quite soft and you can see in the photo it’s melting quickly! Here we served the gelato with lots of fresh strawberries and some vanilla cream (double cream with some icing sugar and vanilla essence added). Needless to say, the strawberry sundaes were devoured and not a speck was left behind! Incidentally, the strawberry gelato on day 2, with the mixture having been left in the fridge overnight, was equally as delicious. Pop the strawberries, sugar and lemon juice in a food processor and whizz until completely smooth. Whip up the cream slightly, just so it thickens a little bit, and mix into the mixture by hand. Chill until cold and and let the ice cream maker do its magic!